I deal with dog to dog aggression far more than any other dog behaviour problem. 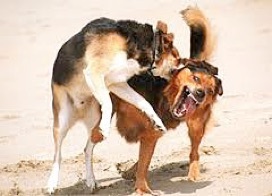 Dogs may show aggression towards dogs both in the family (dog in fighting) and outside of their home. 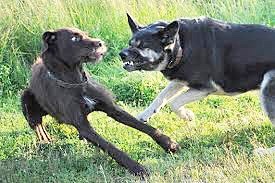 Some dogs are only aggressive towards selected types of dogs typically smaller or even of a particular breed or colour. * At puppy age the dog witnessed it’s mother or father displaying aggression towards other dogs. This is called Learned Aggression. *The dog has inherited the aggression (Genetic Aggression). *The dog has not been socialised with other dogs from an early age. Socialisation should occur early as the temperament and character starts to form in a dog between five and eighteen weeks of age. Consequently the dog feels nervous of other dogs and has not learned to read their body language. *The dog has been attacked by another aggressive dog. The severity of the attack can have a lasting impression especially on a dog which has low confidence or is generally introvert. 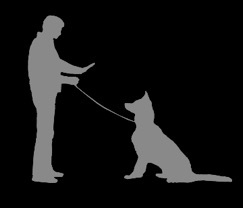 *Some dogs are mostly aggressive when they are on their lead but can be fine off lead. On lead the dog either feels it has the back up of it’s handler or it cannot defend itself and so feels vulnerable near other dogs. Again this may have started through lack of socialisation. 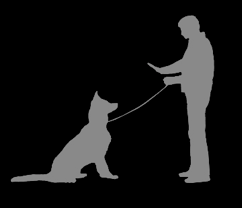 *On the first occasions of the dog showing aggression towards another dog the owner/handler has now learned to tighten it’s lead on site of another dog. This indicates to the dog there is a problem dog approaching. *The dog has become a bully and enjoys intimidating especially smaller or nervous dogs. *The dog is exercising Territorial behaviour and objects to other dogs in it’s area.